Neighbors join your neighbors for a night of fun, food and baseball! This year the West End Association has decided to offer a special deal for members of the West End Association. 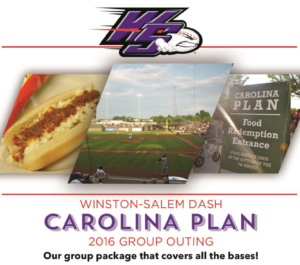 The WEA has chosen the ‘Carolina Plan’ which includes, a ticket, baseball cap, food and group seating. This is normally $21 per person for the group. But for this event and current members of the West End Association, it is only $10 per person for the first 50 members who register! If you are not a member… you can join the West End Association for $20/household and take advantage of the savings. Here’s the Deal: Act Now… only the first 50 people will receive the discount. Hope to see you at the game! Register Now: First 50 to receive the $11 discount. To Register: send an email to Mark Lively mlively@triad.rr.com . Include your name, are you a WEA member or non-member, how many tickets you would like. You will receive a confirmation reply and any other instructions. Pick up your tickets at Will Call next to the Dash box office on game day. If you are not a West End Association member, Join Now, to take advantage of the savings!